Do you need to run a bipap every night? Why does CO2 go up while using a bipap? How long before sleep should i put on my bipap? Can you use oxygen with a bipap? Where did the o2 connect in bipap? What does it feel like being on bipap machine? Bad dreams when not wearing a bipap machine? How much oxygen does a bipap machine use? These are just some of the questions I see when people search for answers when visiting my blog. I hope that the people can find the answers they are looking for. I will try to answer the questions listed above. I don’t have ALL the answers but based on my extensive experience with a bipap machine, I will try to help. Q. Do you need to run a bipap every night? A. If that’s what the doctor prescribed based on the sleep study you had to qualify for the machine, then yes, you should use it every night. A bipap not only helps your breathing but it also provides many benefits to your body to keep it functioning. Q. Why does CO2 go up while using a bipap? A. The only way to know that your CO2 is elevated while using a bipap is to have blood work during a sleep study. I use a bipap to keep my CO2 down. Though, I use oxygen bled in while using the machine. Q. How long before I sleep should I put on my bipap? A. Even though I’m not often ready to fall asleep when I go to bed, I still put on my bipap. Putting it on when I hit the sheets, helps me relax and it allows me enough time to regulate my breathing with the bipap’s settings. There is a difference between breathing when you out of bed verses when you are lying down. Well, there is for me. It’s harder for me to breathe when I am lying down. So, putting on my bipap right away helps. Plus, I read for a while to distract me enough to get my breathing in sync with my bipap. Q. Can you use oxygen with a bipap? A. Yes you can if it is prescribed. Q. Where did the o2 connect in bipap? A. This is the tube that I use to connect my oxygen to my bipap. Q. What does it feel like being on a bipap machine? A. At first, when I started using a bipap, I felt a little like a jet pilot. It was difficult to get use to wearing the mask but I found one that was pretty comfortable. I had problems with anxiety for a while but I took some Xanex temporarily until I got use to all that air going through my nose. When I first put on my bipap mask, I breathe out to help synchronize my breathing with the machine’s breathing. Q. Bad dreams when not wearing a bipap machine? A. Back when there was a time when I could occasionally go without my bipap, I would have bad dreams where I would feel like I was going to stop breathing. This was a sign that my CO2 was rising. I would have headaches in the morning when I only used my oxygen and not my bipap. So, now not only do I use my bipap every night, I can no longer go without it. My lungs are too weak. Q. How much oxygen does a bipap machine use? A. A bipap doesn’t make oxygen or “use” oxygen but you can add oxygen by using an adapter to bleed in oxygen into the hose that leads to mask. I use the adapter (shown above) connected where the hose attaches to my mask. More about bipap machines and sleep studies.. There are different reasons for needing to use a bipap machine. 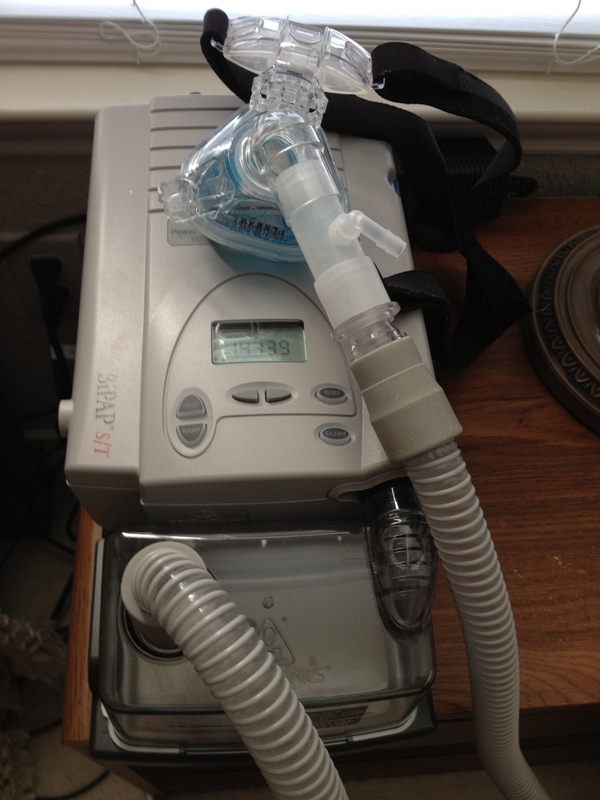 By now, if you have this machine, you know that a bipap is really different than a CPap machine. A CPap machine provides a constant, continuous positive pressure of air through your mask. It’s main use is for what is called Sleep Apnea. Sleep apnea can cause snoring. The continuous positive pressure of air the flows through the hose, tube and into your lungs keeps a your lungs open while you sleep. From experience during a sleep study, I could not tolerate a CPap but many people do well with them. Bipap’s are meant to function to continually breathe for you if in fact you stop breathing. That’s one of the main functions of a bipap. Think of a fail-safe or a backup to your own breathing. This machine is considered a Durable Medical Equipment and you must have a Sleep Study ordered by your pulmonologist to qualify to receive one and for your insurance to pay for or rent one for you. A sleep study is an outpatient procedure where you sleep in either a clinic or a hospital sleep department. The techs will attach electrodes and wires and the mask attached to the Bipap or Cpap. You also get a nifty wire that reads your CO2 and another thing called a pulse oximeter taped on your finger. Oh! They expect you to be able to sleep with all these electrodes wired to your head. Does anyone ever sleep during one of these?? haha! You may not start off wearing the Bipap or oxygen for the test. Try not to panic. They need a base-line of your breathing ability, oxygen saturation and other important data. Don’t try to change the tech’s mind about what you want because they are following the doctor’s orders. They will also attach a nifty wire that reads your CO2 and another thing called a pulse oximeter taped on your finger. Oh! They expect you to be able to sleep with all these electrodes wired to your head. Does anyone ever sleep during one of these?? haha! It will be a few days if not more before you hear the results. There is a lot a data to read from the sleep study.